Managing customer orders on a project basis is one of the biggest challenges in the project industry. The continuous synchronisation between project planning, resource planning and material planning is a major challenge for every project-driven business. Because of the dynamic nature of specifications and plans, it is important to have real-time access to the huge amount of data required (delivery dates, resource utilisation, purchase orders, bills of materials, etc.). Integral control of the business processes has a positive effect on delivery reliability, project margins, utilisation levels, and project overhead. What do you need to confront your challenges? 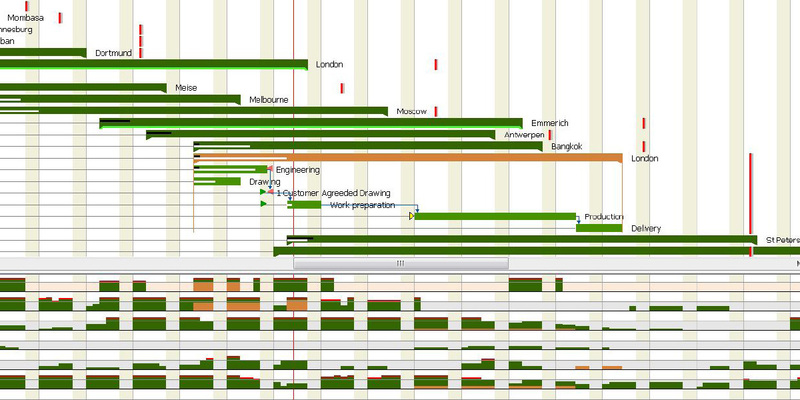 ● Project planning Interactive Gantt chart planning with multiple levels and milestones. Material requirements are linked with project activities and are directly visible in the project plan! ● Capacity planning Graphical-based capacity planning. Using drag & drop, activities and hours in the project plan can be allocated directly to employees and machines. ● Job costing Direct access to projected, planned versus actual and project margin. Extensive ‘drill-down’ options to activity, material and man-hour details. ● Invoicing and Accounting Billing schemas, including milestone billing, activity billing and progress billing. Revenue recognition and WIP control. ● Sales management Extensive sales calculations with generation of different quotations. Completely integrated in opportunity management. ● Workflow All users receive pro-active tasks and automatic alerts to control project disruption. ● Procurement and Inventory Project based procurement and internal production. Project inventory reservations and multiple warehouses. ● Time management Direct and indirect hours in (web) time sheets with multi-level approval stages. If you have the VariAdd Project solution as a Cloud offering, both internal as external employees can work with it. Together with the VariApp TMC all your data is real time and always up-to-date!